Who doesn't love oatmeal cookies? These soft, dense, and chewy Oatmeal Cookies with cranberries and walnuts need to find a way to your holiday baking this year! I'm usually a little late to the start. I always have visions of baking in the afternoon, with Christmas music playing in the background and snow gently falling outside my window the minute I put away Thanksgiving, but it rarely happens that quickly. This year, however, I did get a jump on my holiday baking with these scrumptious oatmeal cookies. I always like to include some of the classic cookies with a bit of a twist in my cookie menus each year...like these Peanut Butter White Chocolate Chip Cookies, Cinnamon Walnut Shortbread cookies, and now these delightful Oatmeal Cookies with Cranberries and Walnuts! Baking has always been my favorite way to spend time in my kitchen. In fact, when I first started having my own kitchen adventures, the first thing I made was cookies. I still have my very first cookbook, Betty Crocker's Cooky Book (1976 edition) and I still bake cookies from it to this very day! The pages are tattered and stained but that's what tells you the recipes can stand the test of time, wouldn't you agree? 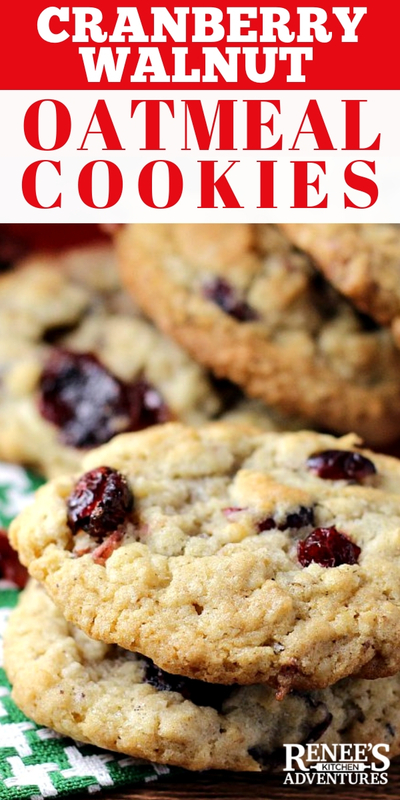 This recipe for Oatmeal Cookies with cranberries and walnuts is loosely based off of an oatmeal cookie recipe found in that book. What ingredients do you need for oatmeal cookies? Oatmeal cookies start off as a basic drop cookie recipe...butter, sugar, eggs, vanilla extract, flour, salt and leavening (such as baking soda or salt) with the added ingredient of oatmeal. Both old fashioned oats and quick oats work in oatmeal cookie recipes. I think you get a chewier, denser cookie with old fashioned oats, so it is my oatmeal of choice for oatmeal cookies. In my Oatmeal Cookies with cranberries and walnuts, I've also added sweetened dried cranberries and crunchy walnuts to the batter for a bit of a twist on the classic oatmeal cookie. How do you make homemade oatmeal cookies? Oatmeal cookies are drop cookies. That means you simply drop the dough onto a prepared pan and bake. No need to roll or shape them. Drop cookies are the easiest kind of cookies to make and require very little skill, which makes them perfect for the beginner baker or for children to make. How do you make old fashioned Oatmeal Cookies? Not a fan of dried cranberries or walnuts? Simply leave them out of the recipe and bake as directed for the best chewy oatmeal cookies in town! 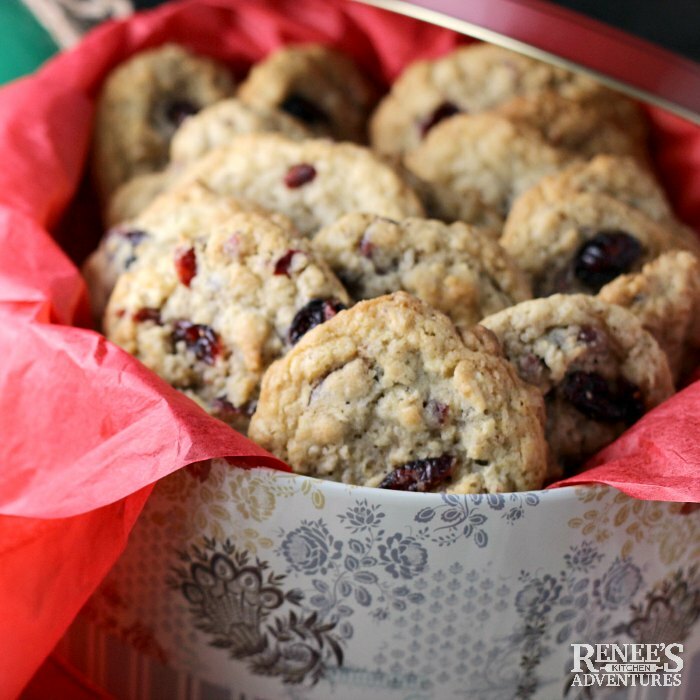 These Oatmeal Cookies with Cranberries and Walnuts freeze well and are great for traveling and gift giving. Make sure the butter and eggs are at room temperature. For the butter that means soft, but still holding its shape. Room temperature eggs will combine with the butter and sugar better. Use real unsalted butter. Salted butter may make your finished cookies too salty. Margarine generally has added water and will make the batter have too much moisture which could result in flat cookies. Mix the wet ingredients well. A stand mixer or a hand mixer will help make easy work of this. Measure the flour by the dip and sweep method (good) or by weight (better) for more accuracy. Baking is all about science and accuracy is everything. 1 cup of all purpose flour weighs approx. 120 grams. Use a cookie scoop for more consistent sized cookies. Evenly sized cookies will bake more evenly. Always allow cookies to cool on baking sheet for 1 to 2 minutes before removing them to a wire rack to completely cool. This will allow them to "set" and not break apart when you remove them. Make sure your leavening ingredients (baking powder and baking soda) are fresh and not past the expiration date on the packages. Soft, dense, and chewy oatmeal cookies studded with dried cranberries and crunchy walnuts. Heat oven to 375 degrees F. Line baking sheets with parchment or use a silpat. In standing mixer, combine the butter and the sugars. Beat until light and fluffy. Add in the eggs, one at a time, beating well between additions. Add in pure vanilla extract and beat for 2 to 3 minutes. In small bowl, combine flour, salt, baking soda, and baking powder. Slowly beat flour mixture into wet ingredients. Add in oats and stir to combine. Stir in dried cranberries and walnuts. With cookie scoop, portion onto prepared baking sheets. (or scoop out by a rounded TBS) leaving at least 2" between mounds of dough. Bake in oven for 9 - 10 minutes, or until cookies are starting to become golden brown. Remove from oven and let set for 1 to 2 minutes before removing from pan to cool on rack. Store cookies in an airtight container to retain chewiness. Baked cookies can be frozen. 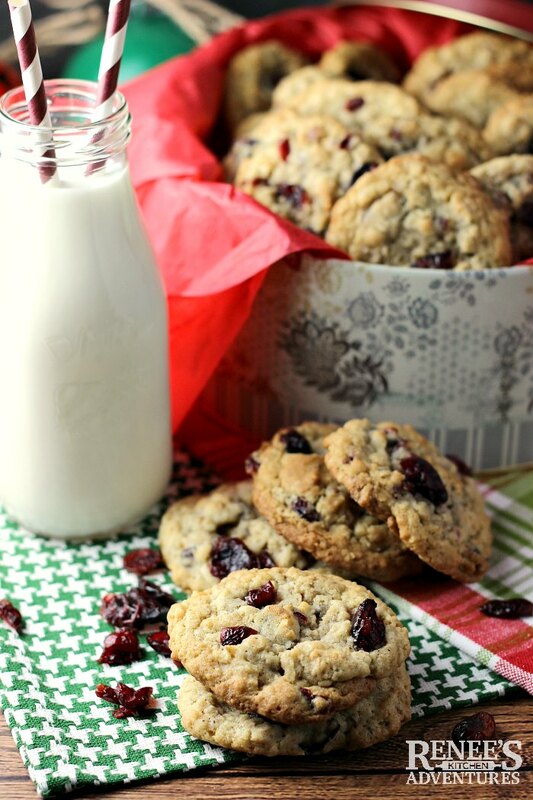 Pin Oatmeal Cookies with Cranberries and Walnuts! We like this version with dried cranberries much better than traditional raisins. So yummy! 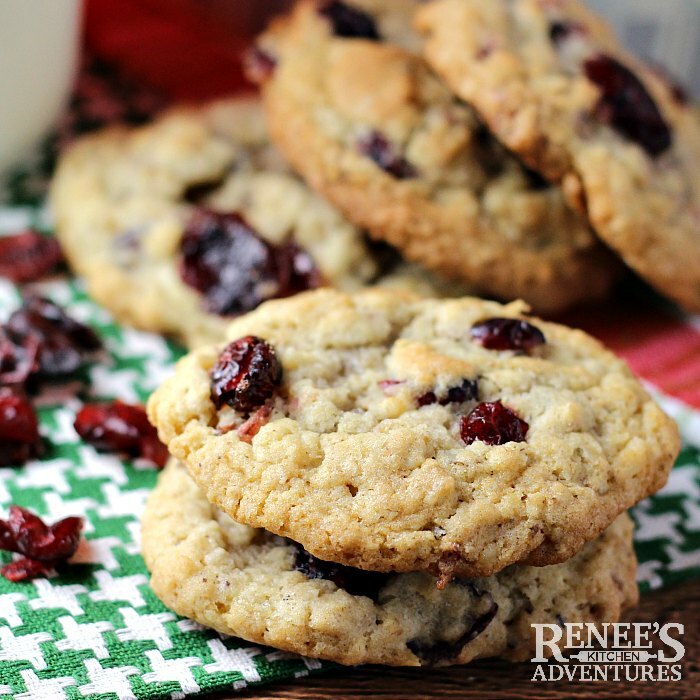 We love cranberry cookies this time of year! So good! I purchased a rather large bag at Sam's Club before Thanksgiving, so I am having fun finding recipes to use them in. They are a great seasonal ingredient, I agree! Thanks for stopping by! The perfect holiday cookie this time of year! Love these cookies so much!